Car accidents in Russia. I don’t understand where all these came from. Does everyone in Russia film themselves driving or something? An interactive map of Mount St. Helens victims. I read them all. Really sad, although some of them were pretty stupid. I also felt bad for the dogs. This Kickstarter campaign, which can’t be real, right? Anyway, this is the smallest, smallest taste of how I have wasted the day so far. 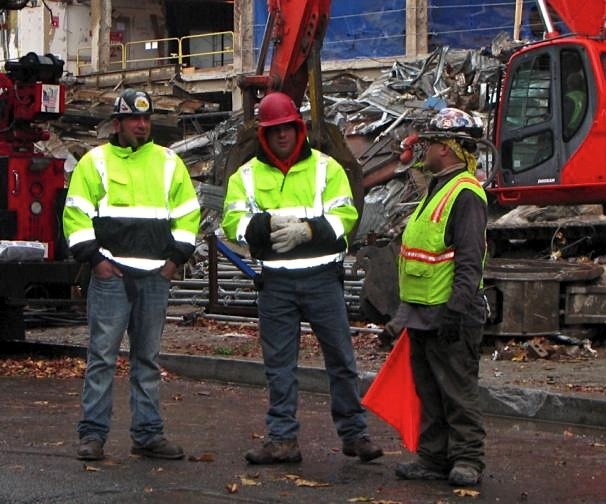 Construction workers in front of the slowly disappearing St. Vincent’s hospital. Destruction must be the kinda fun part of construction work, I think. After saying that, the Columbian article about Mt. St. Helen is really interesting. It not only shows the victims and their whereabouts when they died, but also how hot it was – 644F? Paper self-ignites at 480F. Those poor, poor people. I’m responding to your Kickstarter comment. It’s a bit unclear where she is going with this– but I do agree that larger people often have financial and professional advantages in institutional/Corporate settings, and I think it has a positive theme, which you would embrace. Why is her request for support to write a book about this more astounding than so many others? One of my aquaintences used Kickstart to raise money to pray on her knees, over a month plus period, around Mount Rainier (she got the money). I’m not sure why this one would trouble you. Her sign in the picture says it all. This is not a positive book. By the way, I have often tried to explain to people that it’s just as hurtful to make comments about how thin someone is as it is to say how “fat” you think someone is, but people don’t usually accept this. I’d support a book that tried to make that point. I’ve never seen any evidence that larger people have advantages but I’m very happy to see the new research. But even then, I’m not sure that this is a bad thing. Isn’t there recent research that quotas have been useful in addressing discrimination? And certainly it’s thin people who have had the advantage for so long. In the media, “fit” & extremely thin people have had the edge (not to media women’s dis-advantage). In the corporate and institutional realms, big people have the edge, i.e., tall men & women are seen to be having more authority. Big is better, even if you’re incompetent. When you think about it, on a dumbed down level, it amounts to an issue of the capability of intimidatation… though maybe somewhat off your point. Wow, that has never been my experience, this must be a relatively new development.